Another week and another series of brutal attacks on hospital staff in China. 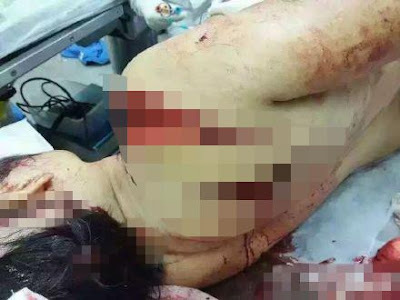 This week it was the turn of an unfortunate female neurologist in Huizhou, Guangdong, who had her hand almost severed when she hacked with a machete by a disgruntled male patient. The man said he was unhappy with his treatment and attacked without warning when the doctor was on her ward rounds. The authorities have made the usual responses - they have arrested the offender and tightened up security at the hospital. Tributes and donations have poured in from citizens sympathetic to the plight of the injured doctor. A petition against violence in healthcare has garnered half a million signatures from doctors - and the Guangdong health department has ordered that all medical institutions have a police office installed and manned around the clock. The attack was one of 12 high profile violent incidents against health staff that occurred last week in China - including the smashing up of the 301 PLA Hospital in Beijing. What is the underlying reason for these attacks? One of the main factors often mentioned is that China's hospitals are simply overloaded and cannot offer adequate care to all patients - who then become angry and violent. Is this because China's health system is underfunded or inefficient? Some interesting answers on the real situation about China's congested hospitals emerged this week in a lengthy paper in the academic journal Health Policy and Planning. It's worth reading if you want to know the background to China hospital system and how it got into the mess it's now in. The authors paint a much more nuanced picture of China's hospital system than the usual overcrowded/underfunded/profit-seeking complaints. First of all they bust some myths. For a start, China's healthcare system is not massively underfunded by international standards - but it is unevenly funded, with most resources devoted to city hospitals. Also, China's hospital system is not uniformly overloaded - only the tertiary (highest level) hospitals are. The lower-level hospitals at county and township level are often underused and deserted because patients flock to what they perceive as the top quality care available at tertiary hospitals in cities. The authors explain that this has come about for two reasons. Firstly, when China's hospitals were reformed by Deng Xiaoping, the high level city hospitals got a lot more investment and incentives than the township and country hospitals. This created a vicious circle because the large hospitals were able to invest in better equipment, and attract more patients. better staff and thus earned more 'business' (and income) while the county hospitals lost out. However, the high level hospitals had two problems - they invested in infrastructure rather than staff, creating a shortage and misallocation of skills at the tertiary hospitals, where many staff are wasted dealing with minor illness. Secondly, the tertiary hospital were bound by tight regulations on prices for essential drugs and medical services. To overcome this, they invested in many unofficial services (eg cosmetic surgery, fertility clinics etc), which diverted resources away from frontline care. The restrictions on prices meant that hospitals had to overservice to gain more revenue - but it also meant that patients had no 'price signal' to seek care from local hospitals. They could get good care at the tertiary hospital for the same price - even if it meant facing overcrowding and rushed consultations. This, then, is the current situation in China's hospitals - an imbalanced system in which all patients flock to the short-staffed higher level hospitals, creating congestion and strife. The article by Dr Sun Zesheng and colleagues at the Zhejiang University of Science and Technology, Hangzhou, offers a simple solution: deregulate prices. They say that tertiary hospitals should charge a premium for their services, and patients should be encouraged to seek less expensive alternatives for non-urgent care at local hospitals and clinics. However, they also warn that the government must invest in better equipment and medical staff resources at lower level hospitals. Until that happens, the big city hospitals will remain congested - and the pressure (and attacks) on staff will persist.